Edmund Cooper was born in York in 1894. It was there that his great-great grandfather had settled when he left Swaledale in the 1850s. Edmund's own father, the York historian, T P Cooper, brought his family each holiday to Muker, where the Coopers had lived since the 1600s. Like his father before him, Edmund brought his new bride, who came from Paris, on their honeymoon, and thereafter his family for their annual holidays. He and his wife spent the last 30 years of their lives in Muker, and latterly in Arkengarthdale, near their daughter, where he died aged 95 in 1989. As a pacifist and a Quaker he served in the First World War as an ambulance driver in France. He was decorated with the Croix de Guerre for bravery. His working life was spent with the Friend's Provident Insurance Company in London, but his great interest was always in archaeology and history, specifically that of Swaledale. 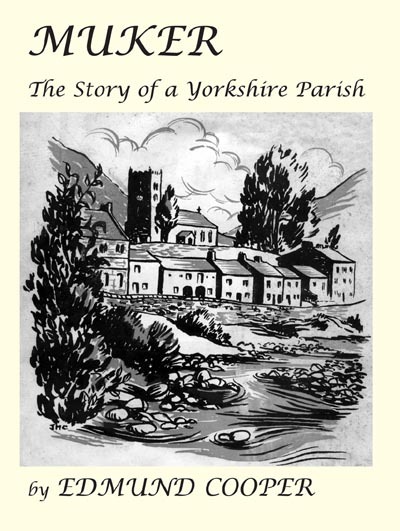 He wrote a number of articles and books on the local history, including Men of Swaledale, A History of Swaledale and this book Muker, the Story of a Yorkshire Parish re-published in this edition. It records a time when much was about to change in the dale. Edmund Cooper's book on the history of Muker was written during World War Two, when the lives of the people of Swaledale were about to change dramatically. By the mid-20th century young people had greater educational opportunities, this and mechanisation in farming, led them to seek employment out of the dale. Electricity arrived, transforming domestic life, motor cars became common, and the tough little working Dales ponies became a rare sight. The Welfare State took away anxieties by providing medical care and pensions, while agricultural subsidies eased hard times in farming. There are few living today in Muker who remember those pre-war days before these changes took place. Incomers, tourists and modernisation have changed life in the village. This book reminds us of the geological and pre-historic past. It records the slow tempo of life over many centuries from the arrival of hunting man to the mid-20th century, portraying that hard, but simpler way of life, with historical facts, traditions and anecdotes.